“We won’t win people over by calling them names, or dismissing entire chunks of the country as racist, or sexist, or homophobic,” said Obama, echoing Hillary Clinton’s disastrous “basket of deplorables” statement in 2016. 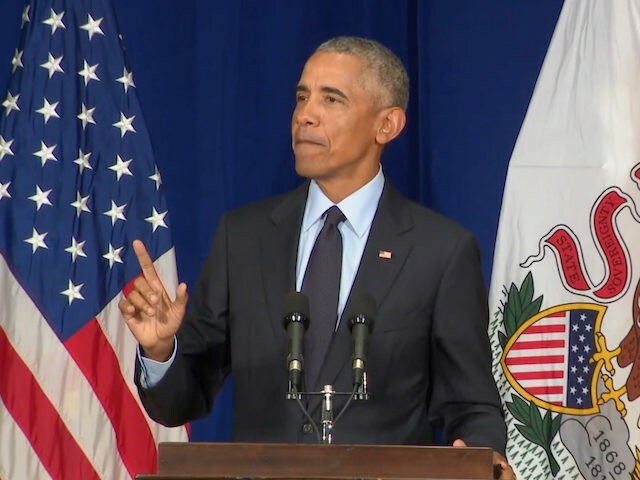 Democrats cannot win “if we think that somehow there’s no way they can understand how I’m feeling, and therefore don’t have any standing to speak on certain matters because we’re only defined by certain characteristics,” Obama said in his Sept. 7 speech in Illinois. But Obama’s cautionary message was hidden by his own resentments and is likely to be lost as Democratic identity groups compete to display their hatred of Trump, national-minded populists, and of popular immigration laws. On Sept. 4, for example, many thousands of progressives shared a Tweet claiming that a white-power sign was flashed by a top aide to Judge Brett Kavanaugh during his Senate nomination hearing for a seat on the Supreme Court. The progressives included Neera Tanden, the president of the Democrats’ main think-tank, the Center for American Progress. On the same day, a 10-term progressive Rep. Michael Capuano was easily defeated by upstart Boston progressive Ayanna Pressley on a platform which included the “Abolish ICE!” demand for ending the enforcement of immigration laws. That election followed the June defeat of 10-term Rep. Joe Crowley to his New York challenger, Alexandria Ocasio-Cortez, who touted her Puerto Rican identity as she backed the “Abolish ICE!” campaign. Both the Boston and New York districts have majorities of minorities, leaving the established white progressives out of sync — or “defined by certain characteristics” in Obama’s words — with their identity-politics bases. The Democrats’ 2018 campaign is accompanied by much hateful language directed at Trump and his allies, as well as a widening range of actual attacks on people and targets considered to be pro-Trump. If the rule of law and the courts hold until Nov.6, our votes will guarantee that racist supporters, a spineless Congress & Vladimir Putin will not be able to save a lying failed grifter. VOTE!!! More than 500 physical attacks have been inflicted on Trump supporters, Breitbart News reported. This August, Vermont Democrats picked a person who claims to be transgender as their candidate for governor. The win by Christine Hallquist, a former utility executive, marks the growing willingness by progressives to endorse the transgender ideology’s claim that law and society should suppress legal, civic and biological distinctions between men and women, girls and boys. In Michigan, Democrats have nominated Rashida Tlaib for the Sixth District seat in Michigan, even though she has vocally opposed a two-state peace deal to end the long war between Isreal and the surrounding Arab populations. You know, to make democracy work we have to be able to get inside the reality of people who are different, have different experiences, come from different backgrounds. We have to engage them even when it is frustrating; we have to listen to them even when we don’t like what they have to say; we have to hope that we can change their minds and we have to remain open to them changing ours. common ground exists. Maybe it’s not fashionable to say that right now. It’s hard to see it with all the nonsense in Washington, it’s hard to hear it with all the noise. But common ground exists. I have seen it. I have lived it. I know there are white people who care deeply about black people being treated unfairly. I have talked to them and loved them. Obama is expected to inject himself into the 2018 midterms, partly to help reverse the impact of his own role in helping Donald Trump get elected President in 2016.